No two years are the same when it comes to flower farming but this year as been particularly difficult! It's been so hot for so long now that it's easy to forget the terrible start to the year we had which was unseasonably cold, wet and snowy. This caused crops to fall behind by about 4 - 5 weeks and affected not just flower growers but many farmers across the UK. Now we are a few weeks into the longest heatwave since 1976 (so it said on the radio the other day). Around 3 weeks ago I could have told you how long it was since we last had proper rain but it's been so long now I have forgotten. There are cracks in the ground in places at the flower farm that are nearly wide enough to get my foot into and although we had a 20 minute downpour last week and a bit of spitty rain for 15 mins yesterday it's not touching the sides. Light rain evaporates before it soaks into the ground and the downpour was great but when the ground is so dry, heavy rainfall runs off faster than it soaks in. In most years we rarely have to water - maybe doing 3 or 4 times a year, but recently we are out most days watering. So whilst sunning yourself in your gardens think of all us who work the land for our income - support your farmers and growers as much as you can right now as we all have higher costs and more work to deal with. This week was British flowers week and it's been a busy one here at Pipley! There has been lots of support from local florists on our three regular delivery days. On Tuesday I delivered 3 van loads of flowers which is an awful lot for us and something I would love to do more often. There are so many beautiful flowers to choose from at the moment and as you can see I'm not the only fan of British flowers in my household! The first dahlias started flowering this week and I'm excited to see the new varieties I have chosen this year in the flesh. On Wednesday it was a real scorcher and I had a group of career change students from the Tallulah Rose Flower School come to the flower farm. I gave them a tour round and we discussed all things British flowers, and afterwards went foraging for foliage for them to use back at school. At Pipley there is roughly one and a half acres of flower beds but in total our land stretches to 19.5 acres and this is made up of a mixture of pastureland, wild hedgerows and woodland - perfect to forage for all sorts of beautiful, wild flowers, foliage, and other interesting bits and pieces on top of the flowers we are already growing. The week rounded off with wedding flowers for a couple in a nearby village - more to come on this in a future blog! Another Winter is upon us and although my growing season for the year is over the dahlias are still going strong. Whilst at the flower farm the other day this reminded me that last year I meant to write a blog post abut these fabulous flowers and I forgot....so I'm now going to make up for it. Dahlias are one of my favourite flowers; I love them for their wide range of colour and beautiful, showy forms. There are single, open varieties such as the infamous Bishop of Llandaff to tiny delicate pompoms which may only be 3 or 4cm in size, to the huge Café au Lait and other decorative dinner plate varieties which can easily be 25cm in diameter. Of course you can't forget the spikey cactus forms and serenity of the water lily dahlia (and that's not an exhaustive list of the forms available). In terms of colour again there is a huge choice and when you take into account the bi-coloured flowers I wonder if dahlias may have one of the biggest range of colours available in one family of flowers. The only colour which is still not seen in dahlias is the elusive blue - the reason why blue is so rare in flowers would be enough to fill another blog! Dahlias have been in Europe for over 200 years now and originally came from Mexico. They are typically grown from tubers and can also be grown from seed but when grown from seed they can naturally hybridise, which explains the huge variety of colours and forms we see today. If you love dahlias as much as I do then the time of year to get excited about is July as this is when they start to flower. They are a fantastic addition to any bouquet or flower arrangement and I use them regularly through the summer....in fact I now have over 400 dahlia plants so I am practically drowning in dahlias but I'm not complaining! A pretty posy made with these easy to grow flowers! I love the way my boys enjoy being outside so much! Even though they are both under three I can tell they will follow in their parents footsteps and be outdoor types. Next year I think it would be great if the boys could have their own little cutting garden where they can pick flowers for grannies and other lucky recipients. Inspired by this and by a couple of suggestions of a Facebook follower regarding things to grow with children and flowers for cutting I have been thinking about easy flowers to grow with children that will produce well for cutting and keep nicely in a vase. Children love to grow plants from seed. There is something magical about this even as an adult. The excitement of checking your seeds and seeing that first hint of green doesn't fade with the years so if you can really get the children involved from the start of the process it will give them a much greater sense of pride in the end. I decided to choose a few plants which self seed because this way We can gather the seed now and scatter it on a prepared area. If you choose self seeders then you shouldn't be able to go far wrong with the sowing so it will be easy for the children to see results. The flowers I have chosen are already present in my garden but if you need to buy the seeds to start you off you should then find you get a fresh supply of seeds each year as long as you leave a few flowers to go over and collect the seeds in time. Or you could just let nature take its course and do the job for you! My suggestions are snapdragons, verbena bonariensis, feverfew, marigolds and nigella. All of these will flower throughout the summer and stand well in a vase. They are easy to grow and once established they will return every year without you even having to do anything. The nigella have the added bonus of the seed pods which also look great in a jam jar posy as a foliage filler! When you have small children and grow snapdragons you also have the opportunity to delight and confuse your little ones by instigating conversations between them and the 'talking flowers'. Our snapdragons come to life on a regular basis and each has its own accent and personality! My grandfather used to do this with me as a small child and I still recall these happy memories vividly. I love the fact that from time to time I have caught my two year old stood in the garden chatting away to the snapdragons...very cute! I just can't believe how fast this year is going! I have to keep reminding myself to sit back and enjoy the sunshine before its Christmas! The summer brings an abundance of work for a flower farmer. There are an array of flowers to cut and deadhead. Plants are working hard and need regular feeding to perform, and of course the dreaded weeds need curtailing to prevent them outperforming everything else in the cutting patch. So I've been busily performing the above tasks and planning for next years expansion. When I saw a program advertising a local flower show I couldn't resist giving it a try. 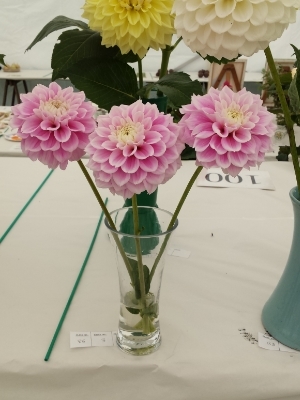 There were various categories to choose from and as I'm swimming in dahlias I decided to enter four dahlia categories, one rose category and I also entered a vase of flowers I had grown from seed. 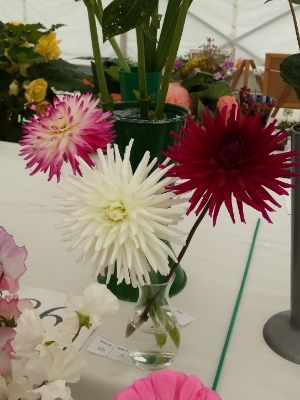 I have never entered a flower show before but I do have experience of showing chickens and I know from this that showing brings with it a lot of rules and standards; you could spend an awful lot of time researching what's expected of a winning entry or you can just dive in head first and learn from your mistakes. So off I trotted with a boot full of flowers and vases. Preparation is everything but as I didn't really know how to display my flowers for best results I just chucked it all in the car and decided I would watch the old timers and try my best to copy them! The rose was easy; one stem cut and displayed in a glass bottle. I realised straight away that my stem should have been much longer and later found out my rose should have been cut when it was less open. Next to the dahlias. I thought my stems had to be clear of leaves (I don't know why I thought this!) therefore my stems again were too short. And my flowers weren't large enough -apparently I should be growing special show bench varieties to do well with dahlias! The vase of flowers was more in my comfort zone. I enjoyed putting this together and added a stem of this and that so I could display lots of forms and colours while showing as many varieties as possible and capitalise on the fact I have grown lots from seed this year. This obviously paid off as I won first prize in that category! I will definitely try my hand at showing again and would recommend it to anyone who has considered it but not yet had a go. It's a good excuse for a day out as there are often lots of activities and stalls going on at such shows so it can be an enjoyable trip for the whole family. I couldn't resist getting my toddler involved and he also won first prize in his decorated paper plate category, winning himself £1.50 which he enjoyed spending today! 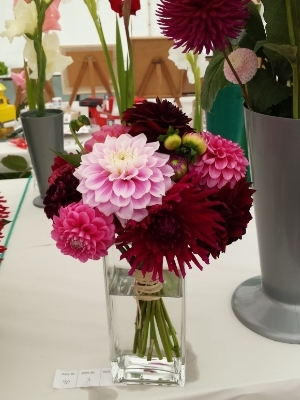 It was a good learning exercise particularly with the dahlias but I think in future I will concentrate on the rose and mixed flower or floral decoration classes. Had a great day out today at Toby Garden Festival which was held at Bowood House for the first time. 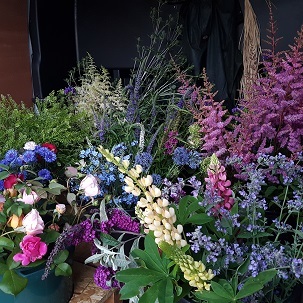 There were lots of smaller independent nurseries like multiple Chelsea gold medal winners Hardy's Plants and it was a great opportunity to pick up some lovely perennials and other garden bits and bobs. I was lucky enough to get a front row seat on Jonathan Moseley's cut flower arranging demonstration. Jonathan showed us how to put together 4 stunning displays. Alongside this we were treated to witty banter and I was pleased to see him strongly promoting British growers and‪#‎britishflowersweek‬. I went home with some great props which I will use on my market stall and in my upcoming photos of flowers....and some very lovely bamboo socks!